Just came off from a red-eye flight from Jakarta back to Manila and is now enroute to catch the defenses of my university students. I wanted to share another queer experience with PR food service. I was just grossed on the fact that after eating the meal served, I was surprised to find out some sort of food stuck in between the unused fork (or at least I didn't use it). 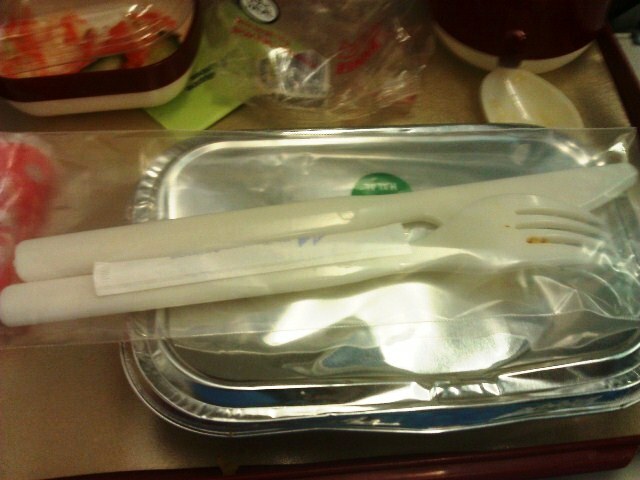 I usually just use spoon and very seldom touch the fork during flight meal service as the food served are usually soft. I know it is hard to prove this by picture and you have to look closely at the fork to see it, but just as always, let's be vigilant, and hope it don't happen to anyone else. I sure do hope this is isolated, and not targetted (to me) lol. * Also, another incident with this flight is that I was promised by the flight attendant to have my drink (diet cola) served later as she headed to the galley, supposedly to get it, after serving drinks to my seatmates as my preferred drink was out of stock. I had to nudge and remind her, as she was collecting the trash and trays after the meal, that I didn't have my drink yet, to which she was very professional and apologetic and honestly informed me she forgot it. No biggie though as I was too sleepy already at that time and she was honest enough to tell me that. Weird... I hope, its just an isolated case. Do they have duty-free service now?